With so many different types of flavors and blends to choose from, buying a vape juice that’s just right for you can be tough. The first step is to get your basics right with the following essential e-liquid buying tips. While there are other important factors that determine the quality and depth of an e-liquid, flavor is indeed the primary reason why people choose one product over another. E-liquids come in a variety of flavors, but if you choose the wrong one, you most likely will end up never using it aside from the one time when you check out the flavor. While tobacco-based vaping liquids are not for everyone, many customers choose tobacco blends over fruity, alcohol-based, and cocktails flavors, particularly if they’re looking to recreate the flavor of their preferred cigarette brand. Once you’ve found the flavor that best fits your preferences, you can then go on to experiment with offbeat flavors—you’ll be surprised at the wide variety of e-liquid flavors available today. While not all e-liquids have nicotine, do know that many of these flavors are created from artificial additives. Only a premium vaping liquid brand can afford to use only naturally extracts in its e-liquids. If you’re looking for an authentic vaping experience, artificial flavoring or preservatives should have no place in your e-liquid. When buying online, carefully read through the product information and avoid spending on a product that has artificial flavoring listed as one of the ingredients. Premium quality nicotine e-liquids are crafted from only high-quality tobacco extracts (also called NET, for naturally extracted tobacco) sourced from real tobacco leaves produced using organic farming techniques. Look out for words such as artificial coloring, chemical additives and sweetening agents when reading up on an e-liquid brand—these are the ingredients you need to steer clear of if what you’re seeking is a gourmet e-liquid experience. 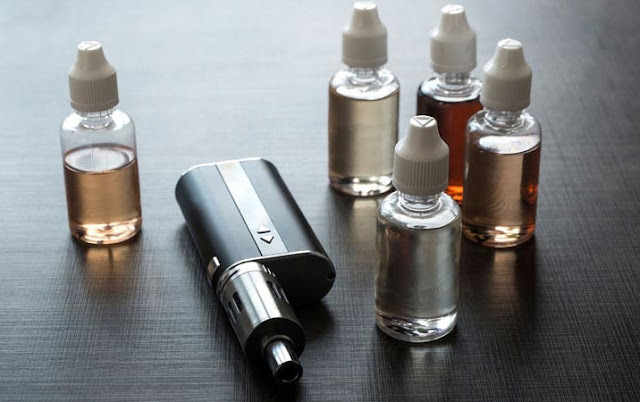 Manufacturers primarily use four key ingredients to make e-liquids: Nicotine, Propylene Glycol (PG), Vegetable Glycerin (VG), and added flavors. PG and VG are organic compounds that have no odor or color. They are used in e-liquids due to their superlative ability to carry and convert into vapor the wonderful aromas and flavors of other ingredients. However, what a layperson doesn’t know is the ideal ratio of PG and VG that makes a good e-liquid product. Experts say that vegetable glycerin is a more effective vaporizing agent than propylene glycol and therefore recommend a 50-50 ratio of both for best results. This proportion ensures a superlative vaporizing experience for the user, which is what vaping is really all about. If you’re a connoisseur of luxury vaping e-liquids of the finest quality, check out RedVape.com, a brand that claims to use only the best tobacco from the finest tobacco-producing locations globally. Lastly, in your efforts to quit smoking, purchase only the best e-cig device and vaping juices, because substandard products can put you off e-cigarettes for good!